Prime Minister Narendra Modi has launched his ambitious Jan Dhan project by “enrolling”, according to an official claim, about 1.5 crore Indians as new bank account holders. But what is most interesting is that during his stewardship as chief minister, Gujarat remained a poor performer vis-à-vis several major states in financial inclusion – which is what Modi is seeking to "promote" by targeting around 10 crore people across India as new account holders by the next Republic Day. 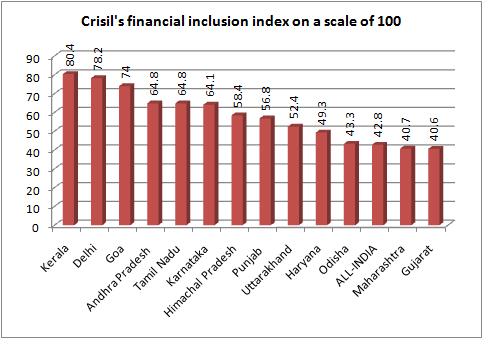 A report by the top consultants, Crisil, prepared in alliance with American agency Standard & Poor, released in January 2014, said Gujarat’s financial inclusion (Inclusix) index was below national average. The report, sponsored by the Union ministry of finance, has reached this conclusion on the basis of an analysis of performance of all Indian states in three critical areas of banking services -- branch penetration, deposit penetration, and credit penetration. Titled “Crisil Inclusix: An Index to Measure India’s Progress on Financial Inclusion”, this was the second report in a year brought out by India’s authoritative consulting firm. Basing on Inclusix index – a special term coined to identify financial inclusion – the report said that found that Gujarat not only slipped its ranking from the 17th position in 2009 to 18th in 2011 and further to 19th in 2012 among 35 Indian states. The state’s Inclusix score in 2012 was found to be 40.6 on a scale of 100 — which was 2.2 points below the national average of 42.8. India’s financial index registered an improvement by 2.7 in 2012, compared to 2011, when it was 40.1. As against this, Gujarat’s financial inclusion index improved by just 2.0. Worse, the data suggest, of the 26 Gujarat districts analysed by the top consulting firm, only 10 districts were able to perform better than the national average (42.8). These districts are Porbandar (56.8), Vadodara, (54.1), Jamnagar (51.6), Navsari (50.4), Ahmedabad (50.3), Kutch (45.8), Anand (46.8), Rajkot (46.4), Bharuch (45.4), and Amreli (44.1). Even the state capital, Gandhinagar, being projected by the powers that be as the “role model” township for other states to follow in financial development, could score below the national average with 42.7. While none of Gujarat districts could make it to the top 50 best performing districts, its backward districts continued to show poor performance. Thus, the predominantly tribal district of Dahod scored 22.7 on a scale of 100, the worst in Gujarat, ranking 571 among 638 Indian districts. The score of other backward districts was -- Banaskantha, scoring 23.4, and ranking 560; Panchmahals, scoring 25.3, and ranking 532; Tapi, scoring 26.4, and ranking No 515, and so on. Each of these districts has considerable tribal population. What should be noticeably a matter of concern for the state policy makers is that such poor performance was registered when Gujarat was being projected as the “financial hub” of India, which is why Modi came up with the Gujarat International Finance Tec-city (GIFT) project next to Gandhinagar as one of the smart cities exclusively devoted to exclusively to finance with huge aims to“rival” Singapore, Dubai, even London and New York. Two major districts with considerable industrial presence Surat, Gujarat’s second biggest city, scored 35.0 Inclusix index, ranking 340. Major states which performed better than Gujarat were – Kerala, with a score of 80.4, double that of Gujarat, Delhi (78.2), Andhra Pradesh (64.8), Tamil Nadu (64.8), Karnataka (61.4), Himachal Pradesh (58.4), Punjab (56.8), Uttarakhand (52.4), Haryana (49.3), Orissa (43.3) and Maharashtra (40.7). Interestingly, the study shows that out of 35 Indian states (both major and minor), as many as 22 of them showed a better improvement in their score in 2012 over 2011, as compared to that of Gujarat. While Gujarat registered an improvement of 2.0 in its Inclusix index, Delhi registered an improvement of 14.0, Kerala 4.3, Tamil Nadu 4.2, Karnataka 4.2, Andhra Pradesh 3.5, Karnataka 3.7, Andhra Pradesh 3.5, Maharashtra 3.2, Madhya Pradesh 3.2, Jammu & Kashmir 3.1, Odisha 2.8, West Bengal 2.5, Assam 2.2 and Rajasthan 2.1.